Had he lived, Michael Jackson would have taken the stage at London's O2 Arena in six days to kick off his 50-date This Is It 'comeback' concert series. In death, his memorial service, held today at the Staples Center in Los Angeles, was perhaps bigger than anything the late entertainer could have envisioned. Despite concerns that the event would become something of a circus, the ceremony was a stirring and respectful send-off to an artist who, in varying ways, managed to touch the lives of generations across the planet. Numerous speeches and remembrances were offered by notables ranging from Motown founder Berry Gordy to present and former Lakers Kobe Bryant and Magic Johnson. But it was the musical performances that brought the impact of Michael Jackson home time and again. After The Andrae Crouch Choir sang We Are Going To See The King, Mariah Carey and Trey Lorenz dueted on I'll Be There. Next up was Lionel Richie, who turned in a gripping Jesus Is Love. Then it was time for one of the day's most anticipated appearances, that of Stevie Wonder, who said, "This is a moment that I wish I didn't live to see coming. But as much as I can say that and mean it, I do know that God is good. I am at peace." And with that, Wonder performed a riveting version of a song he wrote, the now-eerily titled Never Dreamed You'd Leave In Summer (the 1971 track was also featured in Janet Jackson's movie Poetic Justice). Guitarist John Mayer chose to let his Strat speak for itself on a soulful, delicate reading of Human Nature. Then it was time for Jermaine Jackson to bring down the house with Smile, which is said to have been one of his brother's favorite songs. The recorded words of Jackson himself were heard when Jennifer Hudson sang a galvanizing Will You Be There. In a manner that was both charming and chilling,12-year-old Shaheen Jafargholi, who was a contestant on Britain's Got Talent, belted out Who's Been Lovin' You - the Smokey Robinson song that Jackson himself knocked out Berry Gordy with in 1968. Following Usher's impassioned take on Gone Too Soon, it was time for a musical finale that Jackson would have loved: a variety of performers were joined by the entire Jackson family (including Michael's children) to sing the anthem We Are The World. As the event concluded, a photograph of the Jackson family from Michael's childhood appeared on video screens. 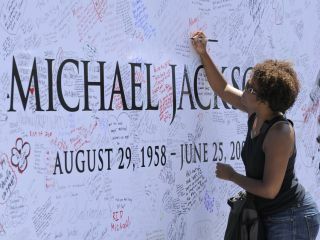 As Jackson's flower-covered coffin was taken out of the Staples Center, Man In The Mirror poured from the arena's sound system. Watch John Mayer's instrumental version of MJ's Human Nature.